Dinner last night was sublime. Sub. Lime. As in there was lime in the sauce on top of it. Er...Yuk yuk. 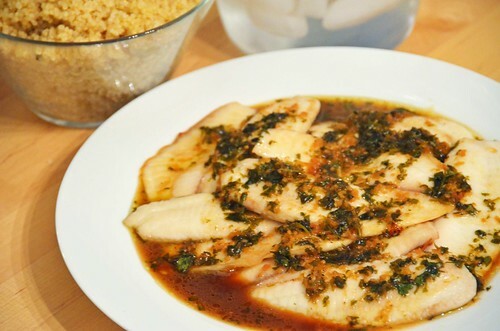 This delightful fish sauce recipe is courtesy of my sister Kathryn. As are many of my recipes, let's face it. However, I'm pretty sure the version I cooked last night is with half the oil. I can't seem to leave anything alone. But if you're going to alter this one, please don't try to thicken it with corn starch. I did that once. Totally gross. The fish sauce needs to be thin so it can flow into the cracks and crevices of the fish. In fact, I usually flake the fish before adding the sauce, so the sauce absorbs all over the fish. Last night, I was cooking for us and another family, so the instructions below will serve 12. First, lay your 12 thawed Tilapia filets out on your jelly roll pans. Preferably on silicone baking mats so you won't have to scrape them off the pan later. I baked mine at 400 degrees until they were done... Really wishing now I'd timed it. Probably between 20 and 30 minutes. Meanwhile, I was working on the quinoa pilaf. I prefer to cook my quinoa in my pressure cooker because it comes out perfectly every time. Nice and firm and still with that "poppy" texture, and falls easily apart. Nothing worse than mushy quinoa. I cooked 3 cups of dry quinoa in 4 1/2 C water and 1 T olive oil. I also added 3 tsp beef bouillon for flavoring. In my marvelous electric pressure cooker, I cooked it for 2 minutes, followed by 10 minutes of natural pressure release, and then quick pressure release. I removed the lid immediately after cooking to ensure that it didn't get overcooked or mushy. While that was cooking, I combined the ingredients for the fish sauce in a saucepan and simmered for the required 10 minutes. You add the cilantro in at the very end, right before serving. 2/3 C chopped fresh cilantro. Combine ingredients in saucepan, and simmer for 10 minutes. Add cilantro right before serving. One of the great joys of my life, incidentally, is to live in a place where large glorious bunches of fresh cilantro can be purchased for $.50 anytime I want. Hint: DO NOT SUBSTITUTE dried spices for the garlic, ginger, cilantro, or limes if possible. It will not be the same, and I take no responsibility for your sadness over the lame flavor of this recipe. Once when I threatened to use dried ginger in this recipe, my sister Kathryn vowed she wouldn't give me the recipe at all if I did. She was right. Trust me, you need fresh. That said: Frozen fresh ginger is a great way to ensure that you always have what you need on hand. It's a little harder to grate, but still tastes wonderful. Once the sauce is going, Get moving with the vegetables for the pilaf. You can do any size and type of vegetables you want, but I chose last night to use carrots, zucchini, and onions. I diced them all up super-fine in my kitchen plus 2000 food chopper. Amazing little contraption. Hand powered. Makes all my dreams come true, and enables me to finely dice all veggies with little to no fuss, and stealthily include piles and piles of fresh veggies in almost every recipe. Just sautee in the oil until they start to soften. Then toss the whole mixture in with the quinoa. When the fish is done, top it with about 1 T of the fish sauce, and also drizzle a little of the sauce over the pilaf. It tastes heavenly.